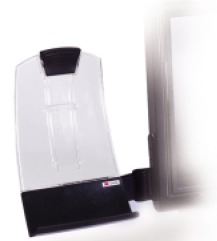 3M offers a variety of ways to securely hold your valuable documents, from just a few pages to the thickest books. Minimize strain, improve comfort. These models position documents at eye level, right next to your monitor, on either the right or left side. They mount with 3M™ Command™ Adhesive strips for easy and clean removal, with no sticky residue. All fold away when not in use. Sleek, lightweight design works beautifully with flat panel monitors and traditional desktop CRT monitors. Grooved ledge with height adjustable clip secures sheets in portrait or landscape view. Swings out of way when not in use. Black/clear. Sheet capacity: 35 sheets. * 30-day warranty.